When the day of Pentecost had come, they were all together in one place. And suddenly a sound came from heaven like the rush of a mighty wind, and it filled all the house where they were sitting. And there appeared to them tongues as of fire, distributed and resting on each one of them. And they were all filled with the Holy Spirit and began to speak in other tongues, as the Spirit enabled them. 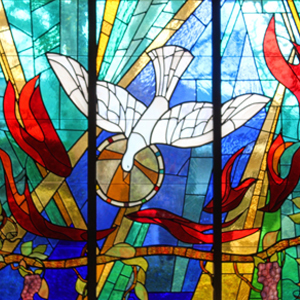 The gift of tongues is bestowed on the apostles as the Holy Spirit descends as a dove, amid tongues of fire. The flames come to rest separately, one on each of the eleven apostles who are gathered, and they are filled with the Holy Spirit and begin to speak in different languages they didn’t know.